Klonopin Colors: What are they and what do they mean? Klonopin colors denote dosage. The significant identifier is the imprint on the tablet identifying the manufacturer and the dosage. 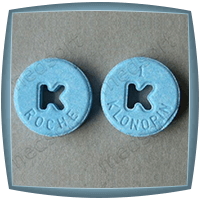 Brand name Klonopin comes in an orange 0.5mg tablet, a blue 1mg tablet, a white 2mg tablet, which will have a K-shaped cutout in the tablet. Generic clonazepam colors depend on the manufacturer. Klonopin® is the brand name of the benzodiazepine clonazepam. Roche Laboratories is the only manufacturer of the brand name Klonopin, and the colors blue, orange, and white differentiate the strength of the medication. In addition to the color, Roche further identifies Klonopin with a K-shaped cutout in the tablet along with an imprint of the dosage and the company name. A half milligram tablet is orange, a one-milligram tablet is blue, and a two-milligram tablet is white. They also make a disintegrating tablet for those who experience difficulty swallowing tablets, and these are white with the dosage imprinted on one side. The combination of the color, shape, and imprint on medication is a system of identifying the drug, the strength, and the manufacturer. Drugs approved by the Food and Drug Administration are required to have unique identifiers or imprint codes for easy identification. The purpose of the colors is to tell pills apart. Clonazepam gained approval as a generic drug in the late 1990’s. Multiple pharmaceutical companies produce the generic version in various colors; the imprint acts as a descriptor of manufacturer and strength. Most insurance companies, including Medicaid and Medicare, will only pay for a generic prescription unless a prescriber can justify the expense of the brand name. The justification usually requires trying generic versions first. White Imprinted on one side with the number 2 and the other side has an imprint of a lower-case b above the number 98. Yellow TEVA on one side and 832 above a horizontal line on the other side. Green An imprint of TEVA on one side and 833 above a horizontal line on the other side. White The imprint of TEVA on one side and 834 above a horizontal line on the other side. Colors and imprints on a pill serve as a means to identify the medication by manufacturer and strength. These identifiers are registered in a database by the Food and Drug Administration and allow for quick determination of legal versus illegal drugs and herbal supplements. Addiction Resource » Addictive Substances: The Anatomy of Drug Addiction » Klonopin Abuse, Addiction, and Treatment » Klonopin Colors: What are they and what do they mean? I’ve taken clonazepam 0.5 pink for over 20 years. It works wonderfully for me. No side affects. The yellow makes me itch. I don’t take well to new meds. where can I get 0.5 clonazepam pink? I also have taken them for 5 years and I live in West Monroe, LA. And they have them at walgreens, cvs, walmart, and etc. But I’m guessing you don’t live around here…. I have just had an annoyance with CVS as I have taken a yellow version of .5 for eight years. They have substituted an orange version which did did not work. Just kept me up all night as if I had taken nothing. It turns out CVS will only be buying from Accord Healthca, going forward, which appears to be an inadequate brand. I am moving all my families prescriptions from CVS. I suspect many will have a problem with this brand. CVS was utterly unwilling to buy from another supplier…despite having used Sandoz for five years. I suspect we will all have to start looking at Brand names more often. I’ve been taking the 1mg green clonazepam for about 6 years~I recently was dispensed “blue” ones. They don’t seem to work as well for me. Has anyone else seemed to have this issue?? I also have the same problem, the blue ones are not working near as well for me it seems. Yes Gina, I noticed a difference also, liked the green pills better.. Same here.. I did take the green ones and now they just give me the blue ones. The blue ones “dissolve” more quickly so I don’t think they last as long in the body. I take the blue ones to help me sleep and I wake up every 4 hours. My wife found one of my old “green” ones, which I took last night and pretty much slept through the night. … The’re both 1 mg. but the green ones dissolve more slowly and last longer in the body. Its been hell have had swollen throat and cant sleep after i take then till 8 hrs later then fall asleep during the day. So I end up sleeping all day long which I didnt do on the other two. They put me right out got 8 hrs sleep ready for next day. Went to pharmacist said they would order the other brand on monday called and all of sudden nasty said they would call when they got them 3/4 thru the month no response from walgreens. The blue Accord doesnt work AT ALL for me! Apparently the green, which worked great for my anxieties, etc, is no longer manufactured. I’m trying to research what to do. I HATE feeling like this! I have taken the green for years and moved to the white and blue ones and they 100% are different. I called the 1-800 number and spoke to a representative for Teva. She told me that whoever owns Teva purchased another company that also made clonazepam and that Teva made a business decision to discontinue manufacturing the Teva brand as of May 31, 2018. She also said that the reason some people experience differences within different brands is due to the inactive ingredients. The active ingredient (clonazapam) is the same, but the inactive ingredients affect how the drug is delivered to our bodies and is why different brands work differently for different people. So far I have tried Accord and Qualitest, neither of which work as well for me as Teva did. The accord blue one works as well as the green one only this time they gavr me solco as the manufCturer and their the ones that keep me up all nite and make my throat swell the have a stylized V on one side 2531 on the other the blue one that works has a C1 on it. Augh! I was about to call my pharmacy too to see why they gave me different ones (blue-Accord) instead of the green-Teva ones because I too felt the Accord brand doesn’t work as good. I don’t fall asleep as fast, I don’t sleep through the whole night, and I have weird dreams! So disappointed! Has anyone taken another brand besides Accord that had similar results to Teva brand? So frustrating! I have also tried the Accord and Solco and do not work. Did you ever find a good generic yet? If so which one and where can I fill my rx at? Which is more potent the 1mg klonopin or the 2mg klonopin? Will the fren 1mg make u happy or just sleep ..? The blue 1 mg C1 does not have scores to break like the green Teva 1 mg. I was taking .5 (2-3) Mylan, they discontinued manufacturing for now. They are yellow #10. Allergic to blue and red and aluminum lake. Brand name is confusing because Genentech says .5 is yellow #10 aluminum lake but the pill is orange. Some info says it has 2 blue dyes and yellow. I’m suffering being on Actavist now. I was on Teva and my life was great. Now, I’m sick and suffering. Being teva back!!! Idc if I have to pay 500 per month, people r suffering so bad now. . Yes. I cannot take any of the blue generic. I have to ask for a 2nd tier generic (usually yellow) as the blue ones do not work for me at all. I might as well have swallowed a Skittle for all the good it does me. Teva green was the best, but no longer available. Pharmacists have explained the change of teva to actavis and of the other 3 I have tried since green teva – solco, actavis (the one teva changed to), and accord – solco is the very very worst. Actavis and accord seem similar, but both are not as good as the green Teva. Why would teva discontinue something that works well (for apparently everyone) and replace it with a sub-par product? Must have to do in some way with profit…. I have been taken Clonazepam 1mg for years. I had the pleasure of having it made by Teva. They were the best. But, Activis bought up Teva. Then they used there cheap stuff generic for clonazepam which was a yellow pill. CVS said that the Activis company is not going to make the green pill anymore. So I tried using the yellow pill from Activis for 3 monyhs and I thought it was a sugar pill. This pill did nothing for me. Then next time I tried clonazepam 1 mg blue pill by Accord and it worked great. But CVS said that they are not accepting Accord Health pills which was an executive decision. So, now I have Aetna Health insurance and I have a list of in house medications. Walgreens, Rite-aid, and most other pharmacy’s are on the in house list for me. So, I asked Walgreens if they have Accord Health clonazepam 1 mg and they do so I am changing pharmacy’s. The pharmacy’s do what’s best for their company. The other thing I wanted to say was that the different genetics that these pharmacy’s make are different per person. One may say Accord Health genetics is better than Activis and so forth. DFon’t listen to all on the internet. You have to try it out yourself and make your own opinion. Good luck all. Blue clonazepam is causing nosebleeds in our son. Anybody else have this problem with blue clonazepam? I have been on the yellow clonozapam for about 5 years and was doing quite will. I skept very well at night. The pharmacy changed them to the pink ones. I was very upset and spoke with the pharmacist about the change he said they are the same pills they chose another drug manufacturer because they were cheaper he said. I told him I was afraid I may have a reaction to the new pills . He didn’t want to speak with me about it just walked away saying they were the same pills. Well I was right he was wrong the pink pills don’t work well for me at all and have effected my brain function. Most days I go off on a rampage get mad easy yelling off and on get upset very easy etc…. goes on and on. I now feel mentally off. Now I’m going back to my Dr this week and see where I can ger the yellow pills. Well the Dr may not know. Does anyone know a well kniw pharmacy that has the yellow pills please let me know? Maybe Walgreens or Walmart has them. I may have to start calling around. It is 2 am cand Im not sleeping. My head gets very dizzy in these pink pills at times feels lije I may pass out. Not good! Wish I could in time get on something else but have to be slowely taken off I was told in a hospital. I have nights my throat gets swollen makes it hard to swallow I can’t stand it this scares me. I didn’t kniw these pills was addictive or would have never taken them the Dr didn’t tell me. Well whats new many people weren’t told. I will need to contact another pharmacy tomorrow soon hope someone can help me out. I have been taking Clonazepam for 32 years. This is my second bad batch of pills. My last fill was 2 weeks ago. Doctor said try and take 1-1/2 pills twice a day instead of 1 twice a day did not work. He also told me to look at the label for the manufacturers code which would tell me what country they came from. I did and googled it. They are manufactured by International Pharma Lab in Pakistan (IPL)that is a Vet Pharmacy that makes drugs for chickens and livestock and is not FDA approved in the U.S. I called Walmart and they confirmed the Lab, when I asked why the head pharmacist said price was cheaper. I told her to find a Pharmacy in the U.S. I didn’t care if I had to pay more. BEWARE IF YOUR LABEL HAS IPL ON IT. C1 on the pill this is for 1mg blue pill.